Elizabeth is a unique addition to the Music Time Academy staff, specializing in teaching early childhood music as well as special needs students. Although primarily a clarinetist, Elizabeth is also trained and experienced on piano, voice, saxophone, violin, and oboe. She currently teaches both private music lessons and our Preschool Piano and Percussion Program. Only a few classes shy from earning her Bachelor’s Degree at California State University East Bay, Elizabeth currently studies Music Education, and is an officer of public relations for the National Association for Music Educators, Collegiate. She has completed extensive training in music theory, as well as instrumental and vocal methods courses for teaching music. 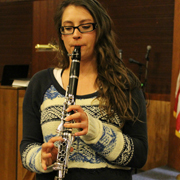 Elizabeth studies clarinet, bass clarinet and contra-clarinet under Diane Maltester. In addition to her daily routine of both learning and teaching music, Elizabeth also volunteers as a church musician where she has the opportunity to perform weekly on piano, voice, and clarinet. Through her years of performance and study, she has a comprehensive knowledge base of both traditional and contemporary church music. Elizabeth’s exceptional interpersonal skills help build a great rapport with her students and their parents. She is both excited and prepared to teach music to children of all ages.